During the opening of the HiNZ Conference in Wellington yesterday the finalists and winners of the NZHIT Innovation Awards were announced. Scott Arrol, CEO of NZ Health IT (NZHIT), said that this year's awards received a huge response with 25 high calibre entries being received. The awards featured two categories - one for a health IT solution based on a New Zealand case example and one for an international health IT solution. The standard of entries was so high that the judges found it extremely challenging to make their decisions for the three finalists in each category and then they had to choose the outright winners. This was no easy task and the two winners and four finalists can be very proud of making it through to this level of the awards as the judges commented on the high levels of innovation shown across all the entries. Sense Medical were announced the winner of the New Zealand Health IT Solution category for their entry featuring Cortex. Sense Medical are building solutions to solve problems in legacy paper-based health workflows and their mission is to fundamentally change how healthcare professionals’ access, create and communicate clinical information to provide best care to their patients. Volpara Health Technologies were announced the winner of the International Health IT Solution category for their entry featuring the early detection of breast cancer. Operating in 36 countries worldwide and now over 1 million US women signed up to its software, Volpara is a leading software company with a focus on the early detection of breast cancer, which is saving lives and reducing the costs associated with breast cancer on a global scale. The finalists in the New Zealand category are ZOOM Health (improving medication adherence) and Pegasus Health (BeeFoundNZ). These two finalists have looked at specific areas of New Zealand's healthcare environment and developed new, innovative approaches that are enabling significant change to the way care is provided. The International category finalists are ableX Healthcare (digital therapy for neurological disability) and Sysmex New Zealand (Sysmex Delphic LIS). Whilst both these finalists, and the winner, have developed solutions that are gaining traction offshore the judges commented that they are applicable to New Zealand's health sector with the potential to enable new models of care delivery. 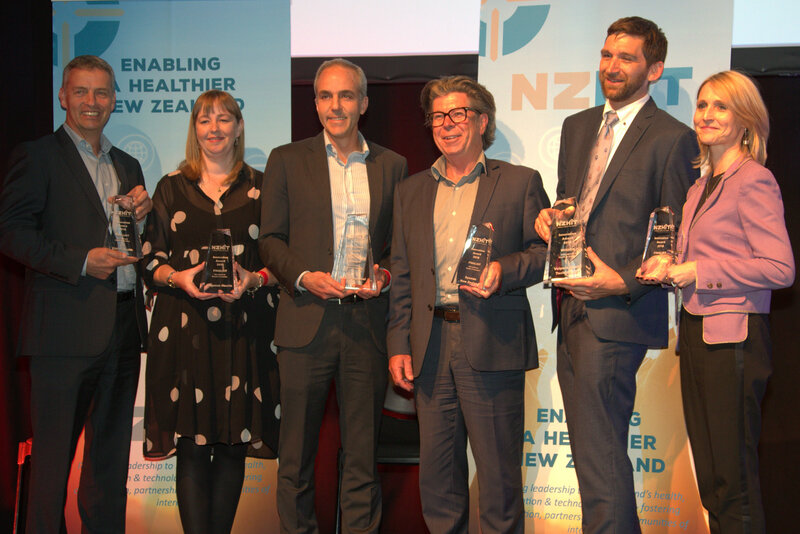 NZHIT launched the innovation awards programme three years ago to provide industry partners with the ability to showcase the digital solutions they have developed to enable enhanced delivery of healthcare services. Arrol says that it has gone from strength to strength each year - "there is no doubt that NZHIT members are leading the way in the solutions being developed through a collaborative approach with clinicians and care providers, we're seeing a wave of highly innovative thinking and development of health IT solutions that are making a positive impact on the health and wellbeing of citizens nationally and globally". The awards ceremony was held during the annual HiNZ Conference being held in Wellington from the 20th to the 23rd of November. This is New Zealand's largest and best digital health conference that goes from strength to strength every year.